We are thrilled to announce support from United States Institute of Peace for our work with grassroots Haitian Women’s groups. Thanks to an urgent grant from their Haiti program, we are launching a citizen reporting initiative for the upcoming presidential and parliamentary elections in Haiti, scheduled for November 28. This week, I’m in Port-au-Prince to launch this initiative along with my colleagues Abby Goldberg & Emilie Reiser. Over the next few days we’ll be training 50 Haitian women as well as meeting with key partners including the Haitian tech company Solutions, the Bureau des Avocats Internationaux and representatives of the UN & Government ministries. Although Abby and I are only here for the week, Emilie will be staying on in Haiti to provide ongoing training and support through the elections. The training will include a discussion of electoral rights, identifying barriers to civic participation in the upcoming election and training the women on how to use tools to report on the elections and electoral-related violence. The training on tech tools includes how to use the Noula platform, FrontlineSMS and how to upload blog updates. In addition to producing a report on this initiative and the findings of our citizen reporters over the course of the next month, this training will help us meet the first part of our commitment to Clinton Global Initiative, to empower Haitian women in the use of tools that will help them organize and respond to gender-based violence. It is a challenging but important time for us to be doing this work. All of our Haitian partners are working to respond to the devastating news of a cholera outbreak, and our coalition of partners including the Institute for Justice & Democracy in Haiti and Madre have filed a petition to the Inter-American Commission of Human Rights on Sexual Violence in Haiti’s displaced persons camps. 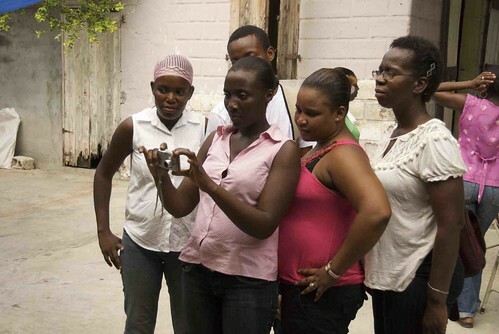 Amidst this very serious news, we’re reminded of how great the stakes are for our Haitian partners, and the critical role of technology to help them address these problems. As I write, two of our partner organizations have just finished a meeting with a song. It’s also a reminder of the human capacity for joy and the need to connect with one another. We hope you’ll follow along on our trip, through blogs, multi-media and micro-blogs - our twitter feeds: Digidem, Abby, Emilie and me.